Take a small mirror and lay it down, so it reflects up at you. Then take a bowl of water (preferably a glass or silver bowl, but any bowl will do. You should use a bowl with pictures on it only if you have to (unless they are hieroglyphs). Only use plastic bowls if you absolutely have to. Put the bowl of water in the center of the mirror, and surround the mirror with candles (this spell should be done in a dark room, or at night). Northeast, Northwest, South east, Southwest). To perform this spell, you must find a suitable shell in shallow water. Take the shell and dry it thoroughly. Next, place a symbol of your desire upon the surface of the shell. The symbol must be made with a substance which will easily wash off in water. Place the shell upon the shore, so that the tide will bring waves across the shell. *Take care to note the phase of the Moon (waxing moon for the gain of something, waning for the dissolving of something). When the shell is in place, draw a triangle in the sand, enclosing the shell completely. The symbol upon the shell must be facing upwards (toward the Moon). Meaningful words, or phrases, may be placed upon the shell also, or simply written in the sand (inside the triangle). Once the waves come, then your wish will be taken out to the Old Ones. 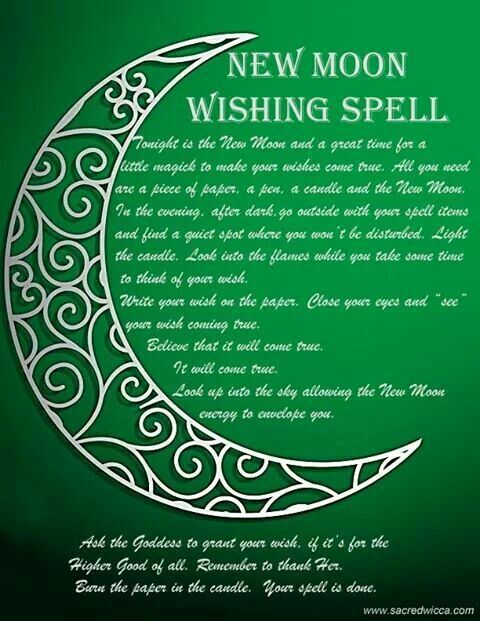 It will usually take about 7 days for a Lunar spell to begin to manifest, but can take as long as 28 days. You need a candle to represent the need, a card to represent yourself, 4 cards to represent your need. Items needed: A small ceramic jar or pot with a tight-fitting lid; 2″ square piece of parchment paper; a gold ink pen; a jar of honey; three silver coins. Place the pot on your altar until your wish come true. Once you receive your petition, toss the pot into the nearest water way. We all wish for lives filled with contentment, health, happiness, and prosperity. There is nothing wrong with wanting the best for ourselves and those we love. The idea behind pocket magic is to create the vibration of success and then take that energy with you everywhere you go. This fetish, therefore, is designed to be a general all-purpose power center that you can energize and draw from as needed. Take any large bowl. Drip a few drops of different-colored candle wax in the bottom of the bowl, then adhere a white candle to that spot. The different colors represent diverse needs and goals, while the white binds this variety together in harmony. Each morning, light the candle when you get up and put a coin in the bowl. Make your wish for the day. Blow out the candle before you leave the house. 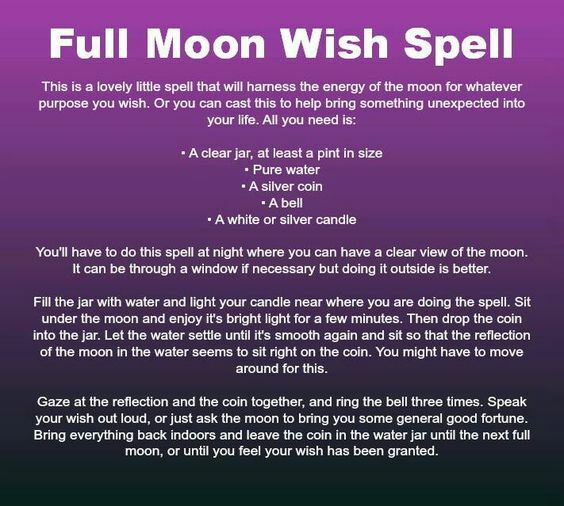 Whenever you desperately need to have a wish fulfilled, remove a coin from the bowl and either plant it in rich soil or throw it into moving water so that your message of need will be carried through the earth. When the bowl is filled with coins, use all but a few (these “seeds” always remain in your bowl) for random acts of kindness, like getting treats for the neighborhood kids or helping a homeless person. Your generosity will return to you threefold to keep the magick of benevolence, both mundane and divine, with you always. To cast this spell you need three bay leaves. On the night of a new moon on a piece of parchment paper write your wish and sign the paper. Next fold the paper into thirds and place all three bay leaves inside. Imagine your wish coming true. Next you need to fold the paper into thirds one more Time and hide it away in a dark place such as your bedroom closet. As you hide it in your closet or another dark place inside your home imagine your wish coming true. Keep this paper and bay leaves hid until you Wish comes true then burned it all. Spread the ashes in front of your home. This spell is now done. Never tell anyone you cast this spell or your wish will not work or continue to work for you. This spell is best performed outside by a natural well or spring. A cauldron filled with water can work as well. Drop the stone in the water. It is done. I ask thee hearken to this prayer.